It features the exclusive Rose die from Cheapo Dies. 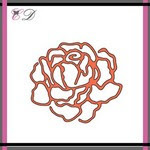 To create this card, I die cut the Rose image from white and pink card stock with Cheapo dies. I inlaid the pink die cut pieces in the white cut piece. I die cut a square on a white card stock with scallop stitched square Unbranded cutting dies. I mounted all elements on A2 size white card base using double-sided tape and foam tape.